Diamonds were formed over 3 billion years ago deep within the Earth’s crust under conditions of intense heat and pressure that cause carbon atoms to crystallise forming diamonds. 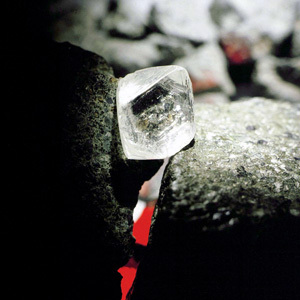 Diamonds are found at a depth of approx. 150-200km below the surface of the Earth. Here, temperatures average 900 to 1,300 degrees Celsius and at a pressure of 45 to 60 kilobars (which is around 50,000 times that of atmospheric pressure at the Earth’s surface). Under these conditions, molten lamproite and kimberlite (commonly known as magma) are also formed within the Earth’s upper mantle and expand at a rapid rate. This expansion causes the magma to erupt, forcing it to the Earth’s surface and taking along with it diamond bearing rocks. Moving at an incredible speed, the magma takes the path with least resistance, forming a ‘pipe’ to the surface. As it cools the magma hardens to form Kimberlite and settles in vertical structures known as kimberlite pipes. These kimberlite pipes are the most significant source of diamonds, yet it is estimated that only 1 in every 200 kimberlite pipes contain gem-quality diamonds. The name ‘Kimberlite’ was derived from the South African town of Kimberley where the first diamonds were found in this type of rock.